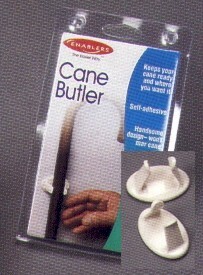 Cane Butler; Enablers, Elderly, Physically Impaired, Arthritis Sufferers. Keeps your cane ready and where you want it. Self adhesive. Designed specially to not mar cane. Comes 3 per pack.